The usually divided Alameda City Council voted unanimously to sideline Jill Keimach. 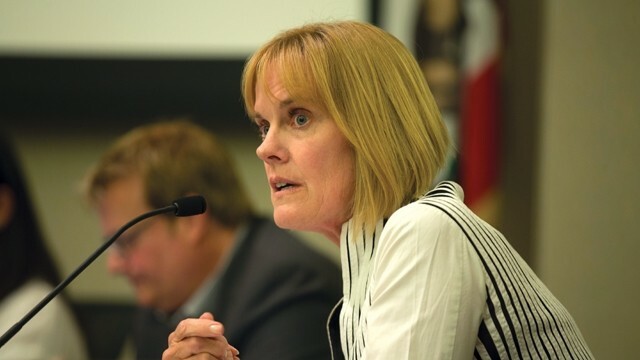 Following a nearly five-hour closed session meeting Friday evening, the Alameda City Council, in a surprise move, unanimously voted to place City Manager Jill Keimach on paid administrative leave. The topic of Friday’s special closed session is believed to have been the results of an independent investigation into allegations made by Keimach that councilmembers violated the Alameda City Charter by interfering in her selection of a new fire chief. Keimach made the claims in a memorandum she sent to the council last October. Alameda Mayor Trish Herrera Spencer declined to comment on Friday’s announcement or offer a reason for placing Keimach on leave. But the post-closed-door meeting statement read by Spencer suggests that the city's investigation into Keimach's claims may have uncovered new information. “The report includes confidential advice regarding potential litigation given to the council, which the council is currently assessing in conjunction with its attorneys. The city will release the actual findings of the investigative report as soon as possible after the requisite legal analysis has been completed and delivered to the city council,” according to the statement. The unanimity by the council is highly unusual. The council often is deeply divided on issues. Friday is not the first time councilmembers have discussed the independent investigator’s report. They also met in a special closed session on Jan. 27 that also lasted five hours, but without any reportable action. Keimach was not seen at either closed session.